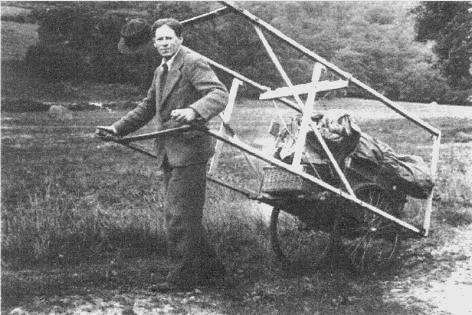 In the comment boxes of yesterday’s post I wrote about the puppeteer Walter Wilkinson, who in the first half of the twentieth century spent his holidays tramping the byways of rural Britain, wheeling his cart loaded with a collapsible booth and a cast of glove-puppets. Wilkinson camped out in fields and set up his puppet booth wherever he thought he might find an audience for his performances. He chronicled his adventures in a series of charming books that went by the titles of the countries and counties he travelled, and copies of them may be found in second-hand bookshops and online at Abebooks. Wilkinson’s goal was to revive interest in the traditions of the ‘peep-show’, though the days when travelling showmen could wheel their puppet-booths unmolested by motorists were already numbered as the car became increasingly popular, and not even the back lanes Wilkinson elected to use as his highways were safe from vehicles as he trundled his bulky hand-cart. But he was undaunted and made journeys through Wales, Scotland and a good many counties of England, including Sussex, Yorkshire and Lancashire, each adventure recorded in a book to celebrate the event. He even ventured a tour of America, and his account of his progress, Puppets Through America (1938) is a delight from beginning to end. Wilkinson with his travelling showman cart. Walter Wilkinson ‘Pearly King’ glove puppet at the Pitt Rivers Museum, Oxford. 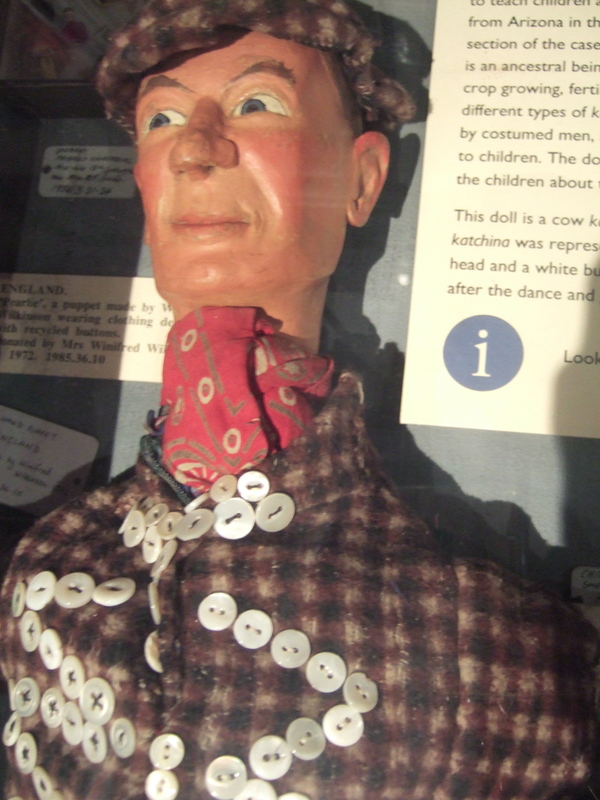 Wilkinson’s glove-puppets are of the old ‘peepshow’ type, with weighty carved and painted wooden heads. They’re much larger in scale than the children’s glove-puppets many of us are more familiar with. Those travelling ‘Punch Professors’ must have been strong fellows, as the old puppets are enormously heavy to operate at arm’s stretch above the head. Frequently two puppets were in play at any time, and so the strain would have been considerable for the duration of a performance. Some of Wilkinson’s glove-puppets are on show at the Pitt Rivers Museum in Oxford, and pretty splendid they are. Wilkinson was a marvellously expressive wood-carver, and the faces of his puppets are always enlivened by character. 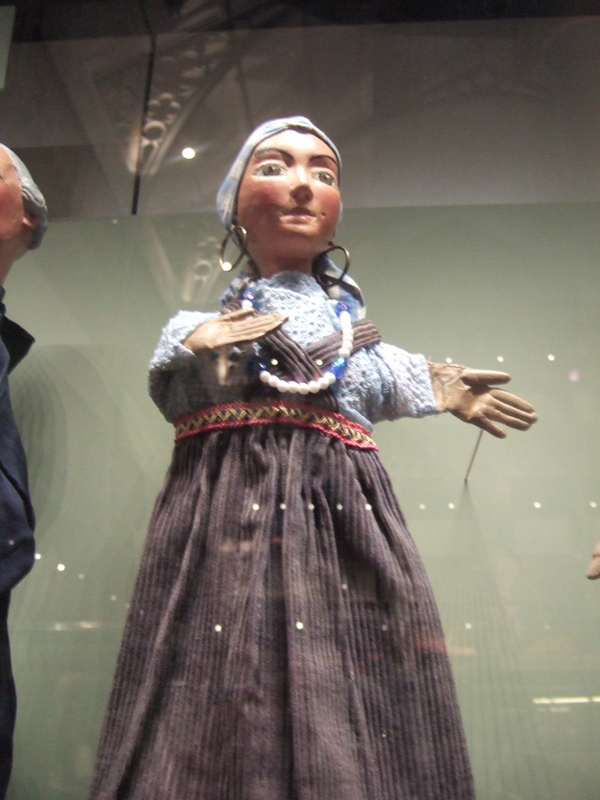 Another Wilkinson glove-puppet in the collection of the Pitt Rivers Museum. Of course it’s vital that puppets such as these are treasured in our institutions where they can be kept safe and shown to the public. Nevertheless, for me there is something infinitely sad about Wilkinson’s puppets when splayed motionless behind glass, with no chance of them being coaxed into life by the hands of a skilled puppeteer. They once lifted spirits, provoked laughter and conjured all the lively drama of the puppet-shows they were fashioned to populate. Without the showman’s spirit to animate them, they simply can’t demonstrate what they were intended for. I can almost hear the gales of laughter of long-vanished audiences, and I wonder whether the puppets can too, and pine for them. My small collection of Wilkinson books. This entry was posted in Toy Theatres and Puppets and tagged Walter Wilkinson by Clive Hicks-Jenkins. Bookmark the permalink. Short clip on YouTube about two chaps who are walking through Cumbria following in the footsteps of Walter Wilkinson. many areas of north Lancashire were re designated as Cumbria when county boundaries were altered, the area visited by walter makes for interesting reading as the M6 now cuts through some of it. Does Walter Wilkinson have any living family or descendants? Also, how do I get a copy of puppets in Australia? James, I haven’t done any Wilkinson research in a long time. I’ll go through my files and see what I can find, but it may not be for a little while, as I have an exhibition about to open and things are very busy here. Dear Clive, just came across your very interesting site on Walter Wilkinson today. I have had a fascination with WW’s books since I first picked one up in a second-hand bookshop about 15 years ago. Being a Yorkshireman, his book on that county is my favourite of course, and would definitely be the one I would take take to that Desert Island! Not long after I first became captivated by WW’s works, I somehow got in contact with Des Turner (Ex-President of The Punch and Judy Fellowship). Des very kindly emailed me a long and detailed account of WW’s early life together with his older brother Arthur Wilkinson (who later founded the Gair Wilkinson Marionette Company). Des also advised me that he had been working on a biography of WW in association with another party, but sadly it seemed that the association had broken down and the project abandoned. Does anyone out there remember the Channel 4 production of The Peep Show which ran for a few episodes (in 1982 I think)? Roy Hudd took the lead part. This was long before I ever picked up the first WW book of course. Channel 4 say they have no copy of it in their archives. Wonder if anyone videoed it? 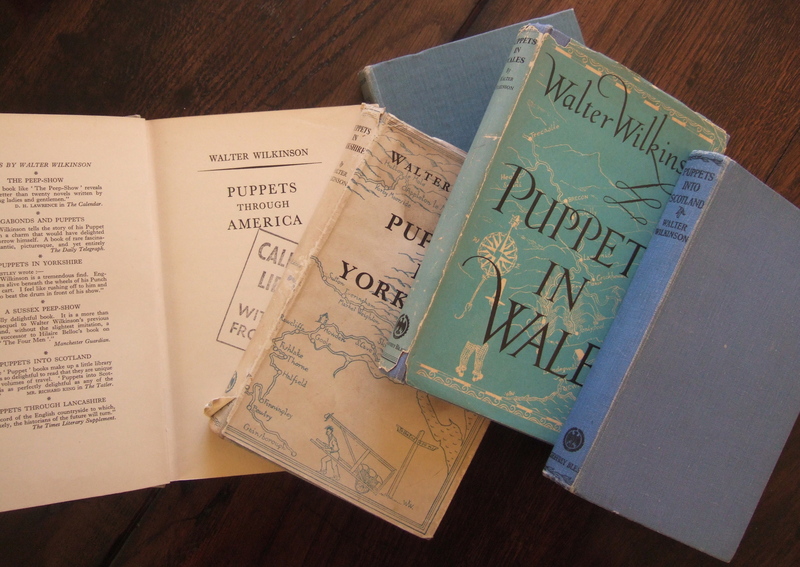 The adventures of puppeteer Walter Wilkinson set in North Devon. Innovative video 6-part series drama-documentary. Puppets by John Wright. Animated by Ronnie Le Drew. With Roy Hudd, Jonathan Cecil, and cast of 120 character actors. Ive got a few documents that might interest you – one is an article by Ann Hogarth (Muffin The Mule fame) written from notes taken from Walter’s wife Winifred after his death. I dont think Walter spent the second world war years entirely in America though he did visit twice. On the second visit he was invited to give a private showing at The White House by Mrs Roosevelt for her and her friends. And your suggestion that Walter may have fought in WW1 is almost certainly incorrect I think as he was a conscientious objector and imprisoned for that reason. I realise that this is some time after the original post but I am so glad to see that others also remember the TV show. My memory may be mistaken but I believe it was called The Puppet Man. Roy Hudd was excellent in the role of Walter Wilkinson, never better in my view. I have looked in vain for repeats or a video release over the years and I am sorry to hear that Channel 4 no longer has a copy. It was extremely well done. Hi Liz yes a great pity that this series seems to be lost forever. Roy Hudd refers to it a couple of times in his autobiography (called, rather inelegantly, “A Fart in a Colander”) and describes the production as being rather chaotic with little proper direction. What is the book “Puppets into Scotland” about? I’m interested in the history of Scottish puppetry but I don’t know if the book is dealing with scottish theatre tradition at all. Walter Wilkinson was a British puppeteer who operated as a travelling showman with his puppet cart. He wrote about his experiences as a peripatetic puppet showman, and the books are wonderful observations of a rural world in the 1930s and 40s that has now long vanished. I don’t think anyone travelling now could do so safely, even on country roads, on foot pushing a large handcart. So, Puppets into Scotland is not about the Scottish tradition of puppetry, but about a travelling puppeteer’s experiences of taking his puppets to Scotland. I’d recommend it to anyone who loves puppets. I found Wilkinson through this blog and now have a collection of his writings that I am enjoying immensely. Thanks for the information that I would never have otherwise seen. I hope that the Australian connection can be made more secure soon. O’d love to read what he said about us. I am the missing link when it comes to Walter I spent a good number of years researching his life and have all the manuscripts belonging to his books along with unpublished items. Just read ‘…through America’ while in France. I think he would have appreciated the irony. Have always felt there may be a Quaker influence there because of particular sympathy with the landscape and the way it has the capacity integrate people into its bosom. Could not help myself and had to have a day in Lyon meditating on WW, Guignol and hand puppets in general. In fact my public performances began when I was about 12 but there was an hiatus of many years until recently when I began to re-collect a puppet library that I disposed of some 20 years ago – that’s when WW came to light because I only had technical books previously, but now have many other aspects in the collection. It would be a delight to see the Australian manuscript in print, and it could be managed if you wanted such to happen. Hello Peter, this is a reply to your post a couple of years old re Walter Wilkinson. I am interested in reading a copy of the Puppets through Australia manuscript. The book is been checked as we speak and will be published soon in a limited number as soon as I get further details I will put details on this site. However if I can answer any questions feel free to ask. The book is been checked and as soon as I have further details I will put on this site in the meantime if you have any questions feel free to ask. has the book been published yet? any progress at all? love to find out more about WW. I’ve created a Wikipedia page for Walter Wilkinson. I am just a fan having read his books, so is based from information contained within his books and readily available internet sourced information. If anyone can add further detail, please do not be afraid to edit/add. Thank you J B Wilson. I’ll go and take a look. What became of Mr. Wilkinson? After his U.S.A. journey, he seemed to have vanished. Did he get lost in the Second World War somehow? I undestand, he wrote a `last´ book, that was not published,.. Australia. Did he spend his last days there? …maybe through his brother,.. early partner? Hello Gallagher Hayes. Thank you for dropping by the Artlog. This site is principally about my own work as a painter, but because I have a history of puppetry stemming from my early career as a puppeteer in a large company, puppetry has always been the tap-root of my creativity. As a result I occasionally make posts here that reflect my connections with the art of puppet-making and performance. 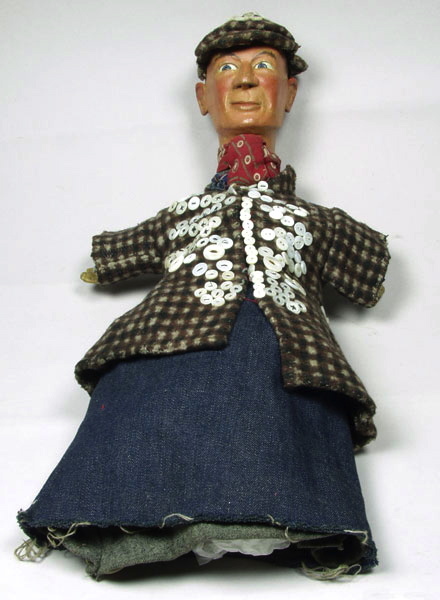 But for now I shall just say that he didn’t get ‘lost’ in the Second World War, though he was imprisoned as a conscientious objector together with his equally famous brother, Arthur, who with his wife formed the Gair-Wilkinson Marionettes. Walter’s dates were 1888 – 1970, and there is a plaque commemorating the first of his peep-show wanderings at Selworthy in Somerset. Is your interest in the subject casual, or are you studying Walter Wilkinson? … I´m a Street Performer, with my wife… since… uhh… a good 30 years. Along the way, we crossed paths with the Walter Wilkinson legacy/philosophy. I´m not an ‘apple cider drinking car kicker´, but we believe in playing the small towns, giving the Show away, letting what comes back, come back. Actually, I´m a Canadian, if that matters, and Monika is German. Wwe play mostly Germany, France, Switzerland… again, the small towns. Few festivals and we avoid tourist. art is in the ‘banal’… the day-to-day… the everyday. “…Walter Wilkinson assisted by Winnifred W was engaged by the Australian Children’s Theatre run by Joan and Betty Rayner in 1954. (see CLARK “Strolling Players” 1972 Lansdowne Press). I have an advertising leaflet in the archive here for that tour. 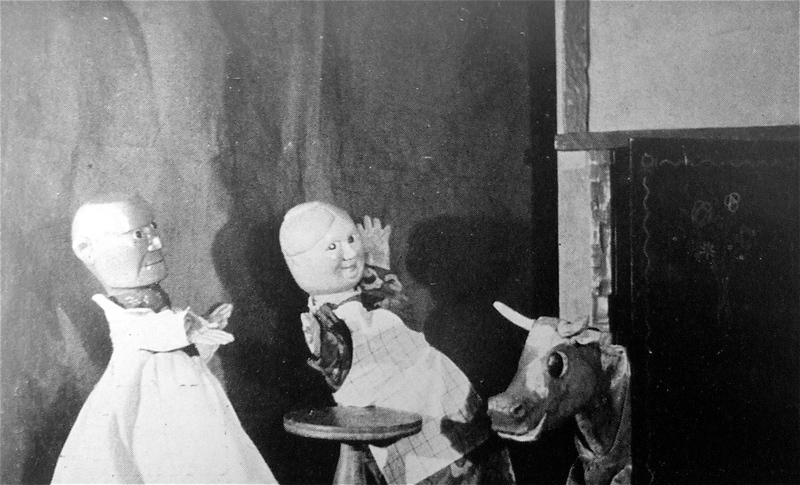 The last I heard of the manuscript for Puppets Through Australia, was that it was in a tea-chest full of photos and his other writings in the village of Braunton in Devon close to Selworthy, where W.W. may have lived at one time. The owner was not interested in doing anything with it and at that time had a rather ‘dog in the manger attitude’. Richard Bradshaw may be able to give you more information about the Australian tour. I haven´t been able to follw it up,.. yet. Clive, I´ve got to go. I know Ray of old, having purchased many books from him, though we haven’t been in touch recently. He is the fount of much knowledge. Thank you for carrying the W. W. post a little further out into the blogosphere. Great to read in the comment boxes here that he’s won a few new fans. Pleasure! And very gratifying that he’s garnering new fans. If you want to see some of my works on stage and when you have time, click on the label “puppet theatre”! You are welcome! Went on a little foray into your website to see your puppet work. Wonderful things there. I love the images of your Hemulen and Snufkin puppets, and also the beautiful work you did on The Steadfast Tin Soldier and The Ugly Duckling. Rapunzel too looks ravishing. You clearly have a wonderful affinity to the world of puppets. Gorgeous post. And, yes, tinged with a certain sadness – all those wonderful characters alas, no longer whinnying. Lovely to hear that yours get the chance to dance to life when eager hands allow. A surprise success for my little Wilkinson post, for which I’m much gratified. It doesn’t always happen that one’s secret enthusiasms meet with widespread recognition or approval. 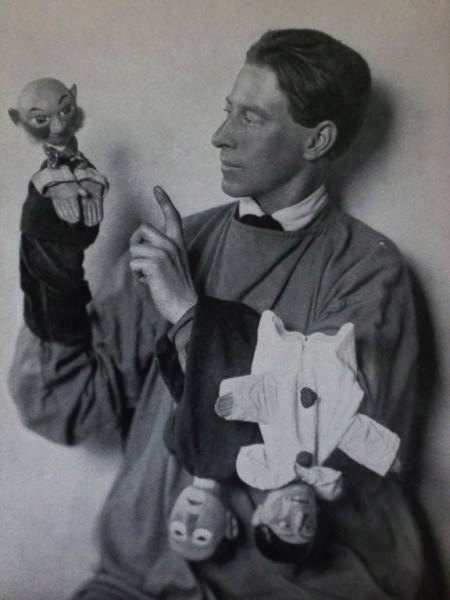 I felt I hadn’t traced down enough photographs of W. W.’s puppets to make a post of sufficient interest, and yet despite that paucity, his story seems to have struck a chord with quite a few of my visitors. I’m hugely pleased about that, and I shall try to track down more pictures. My puppets never languish for too long under glass. All our little visitors like to get their hands on them, and so I’m forever giving marionette lessons! Just wondering if you have been to the puppet theatre in Rhos-on-Sea in north Wales. I haven’t been myself but it is said to be one of the few remaining proper miniature theatres with marionettes in Britain. Wilkinson’s puppets story is fascinating and I did not know anything about it until now, also yesterday the Brussels puppet theatre link was very interesting, thanks Clive. I know the Harlequin Theatre of old, though it’s been a long time since I visited. It’s wonderful that such a venerable institution has survived, and moreover is the repository of the many puppets that have played on the stage there over the decades since it opened in 1958. It was founded by the puppeteer Eric Bramall. Eric died in 1996, and since then the theatre has been run by his partner Christopher Somerville. You can read more about the history of the Harlequin HERE. Hello Rima. All good wishes for the New Year to you and Tom. May it be full of the good stuff. Glad you like the puppet post. Wilkinson was a fascinating man and clearly a traveller at heart, spinning magic with his puppet players as he strolled the countryside. I’m so pleased that visitors to the Artlog have found his story to be an interesting one. I loved reading this Clive. 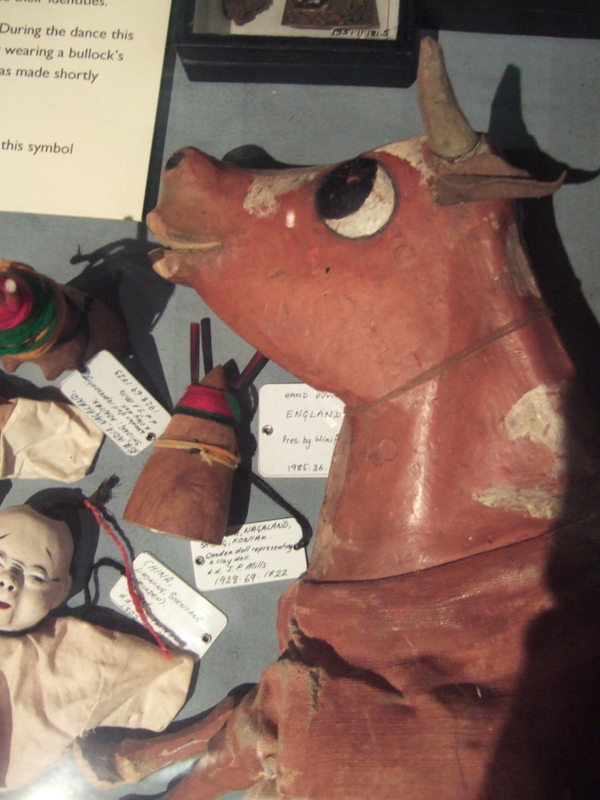 I shall look for these next time I’m in the Pitt Rivers. It’s one of my favourite museums. Happy New Year to you and Peter. Hello Mary. Happy New Year to you and Andrew. Yes, the Pitt Rivers is a wonderfully evocative museum. It’s good that this example of how collections used to be displayed has survived into the twenty-first century. In a world where so many museums are pretty minimal in presentation, with fewer objects on show and more space given over to digital representation, it’s good to be reminded how potent ‘objects’ remain in terms of understanding the past, and to remember there’s nothing to equal seeing something with your own eyes. Hello! I was so excited to read this interesting post! I’m a puppet theatre director from Bulgaria, that’s why it’s a real pleasure to learn about that remarkable puppeteer! Oh, the puppets behind the glass… I suspect they are glad when someone stops there! And although motionless, they are still full of life… And they will ever be! I’m delighted you called by here to read about W. W. He was indeed remarkable, and his life and work deserve to be celebrated. I’d be so interested to hear more about your work as a puppet director, and so please consider pointing me in any direction where I can see something of it. Later this year I’ll be directing a music theatre production in which I’ll be using puppets to create the significant dramatic moments. You can read a little about it HERE. I did a workshop years ago with puppeteers, breathing life into inanimate objects – it was fascinating. I made my first visit to Oxford this holiday but I didn’t make it to Pitt Rivers. I barely scratched the surface of the Ashmolean. It’s a must and soon. Clive I am so looking forward to seeing what you do this year. Thank you for sharing your knowledge and enthusiasm, as ever. After leaving the Italia Conti Stage School aged fifteen-and-a-half, my first job was as a puppeteer with the Cardiff-based Caricature Theatre. My time with the company instilled in me a passionate enthusiasm for all things puppety, and later I began to use puppets of all types in many of the productions I worked on as both a choreographer and director. Breathing life into inanimate objects has been a part of my life for almost as long as I can remember. I can barely pick up a cup with my tea in it without wanting to manipulate the vessel into a semblance of life! I’m greatly looking forward to diving into the world of puppets again this year with the ‘Mare’s Tale’ project for the Mid Wales Chamber Orchestra, and you can be sure that I’ll be sharing progress on my work on it here at the Artlog. Thank you, Patricia, for your support. I had never heard of this master puppeteer until Clive Hicks-Jenkins’ post. I had to share it with you all. So pleased that this post hit the spot for you. Wilkinson deserves to be better known, but somehow he’s slipped below the radar. He made such beautiful puppets and from all accounts was a most skilled performer. It certainly did! I shall be looking out for his books now. After reading the post last night I found a copy of Puppets in Wales on Ebay and it’s currently mine for the exorbitant sum of 99p. That seems such a pittance to pay for the charm I think that awaits me. The Pearly King certainly does has a wonderful expression and thanks for fleshing out Walter’s story Clive. I’m looking forward to getting know him through the pages of his travels. That’s a cheap read, Lesley. Puppets in Wales is a little harder to come by, so you did well. Wilkinson writes about parts of Wales close to my heart, including Crickhowell, which is just down the road from my beloved Tretower. ohhhh! they’re fantastic! they should be taken out at least once a year for a show, why not? that way, they can be dusted and polished, etc, at least once a year as well. You’re right about their strength, too-i was thinking –he *walked* all over the country with that cart?? Yes, walked, set up shows, performed in village squares and camped out under the stars. He was an adventurer, and his books convey a wonderful freedom of spirit as he goes about the countryside. I would have loved to have met him. Love this post Clive. Puppets through America is a favourite book of mine (and my mothers). BBC radio also read it as a story about 6 years or so ago. I couldn’t agree more, all puppets need to be used and loved. I checked out the BBC website, but the series isn’t available for ‘Listen Again’. I have puppets in cases here at Ty Isaf, as I’ve collected quite a few over the years. However they come out whenever we have visiting children who want to play with them. Some are old and quite rare, but they’re always available for careful pairs of hands. Puppets need to come to life, and that can’t happen without a little help!